BBVA Compass Stadium nicknamed “The Oven” by some fans, is a purpose built soccer stadium in Houston, Texas. 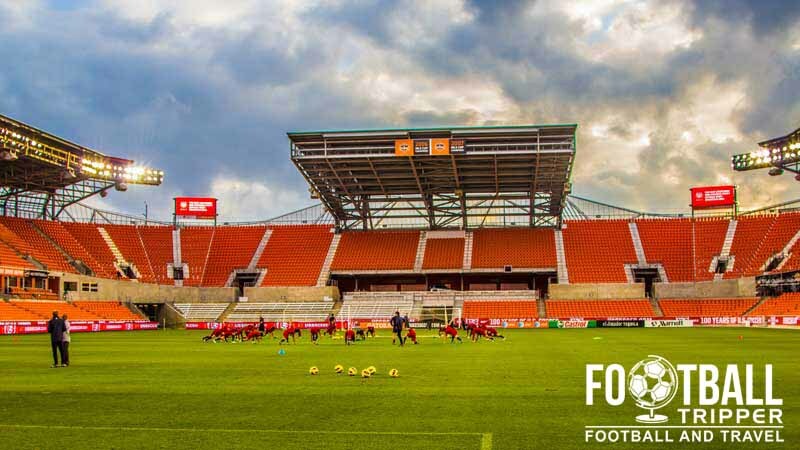 Home of Major League Soccer side, Houston Dynamo and women’s soccer team Houston Dash, the 22,000 capacity stadium opened in 2012 and is one of the most state of the art grounds in Soccer today. 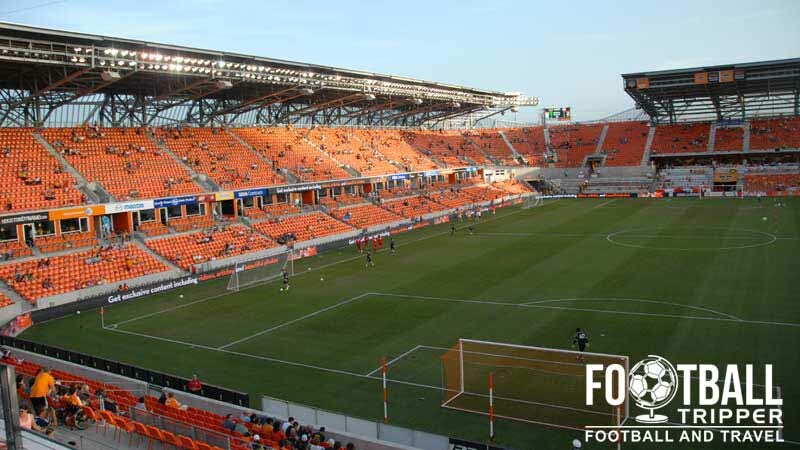 Although Houston Dynamo moved into the new BBVA Compass Stadium during the 2012 MLS season, the club were forced to play their first seven matches on the road as the stadium took slightly longer to complete than expected. This meant that the inaugural competitive fixture came on 12th May 2012 with Dynamo christening the new ground with a 1 nil victory against DC United. Plans for a new state of the art Soccer stated were mooted as far back as June 2009, however it wasn’t until April the following year that the Houston City Council members unanimously approved the Downtown location. The ground was broke on 5th February 2011 and construction took approximately 15 months in total. 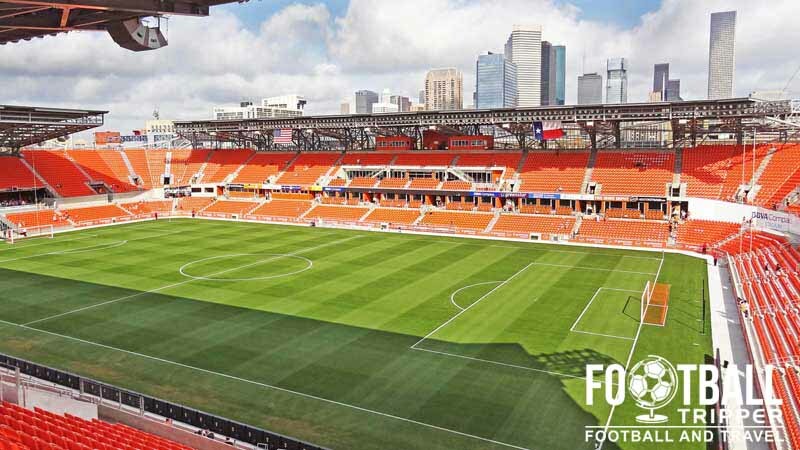 Designed by Populous Sports architects who are responsible for designing iconic soccer grounds such as England’s national stadium, Arsenal’s Emirates and Soccer City in Johannesburg, Houston Dynamo’s ground has proven very popular with supporters from Texas and the world over. The official name BBVA Compass is derived from a 10 year sponsorship deal signed with Multinational bank, BBVA Compass. The company has a strong presence in the Spanish speaking world having sponsored Spain’s La Liga and Mexico’s Liga MX. BBVA Compass Stadium is comprised of four stands: North, East, South and West. Visiting fans who make the trip to Houston are usually housed within the corner of the south stand, almost opposite Dynamo’s lively supporters groups. Whilst you can purchase light-beer inside the stadium, fans often choose to congregate in pubs around the stadium. Three of the more popular establishments on game days are located towards the western side of the ground: Lucky’s Pub, Mojeaux’s Louisiana Drinkery and The Grove at discovery Green. Besides a handful of designated spaces within the car-park for tail-gating, and plentiful fast-food options once inside the concourse, there are a good number of bars which serve food. The stadium’s official website recommends the aforementioned bars, as well as Huynh Restaurant (Vietnamese) Ninfa’s on Navigation (Mexican) and The Lake House Waterside Cafe (American Grill) . The Soccer Shop is located opposite Section 114 on Texas street towards the northwest corner of BBVA Compass Stadium, and is open for up to one hour before “gates open”. Fans must have a valid ticket to enter on matchdays. As the store is only open on game days, you might want to check out the club’s official online store, Houston Soccer Shop. This will allow you to browse the Dynamo merchandise with no time constraints. 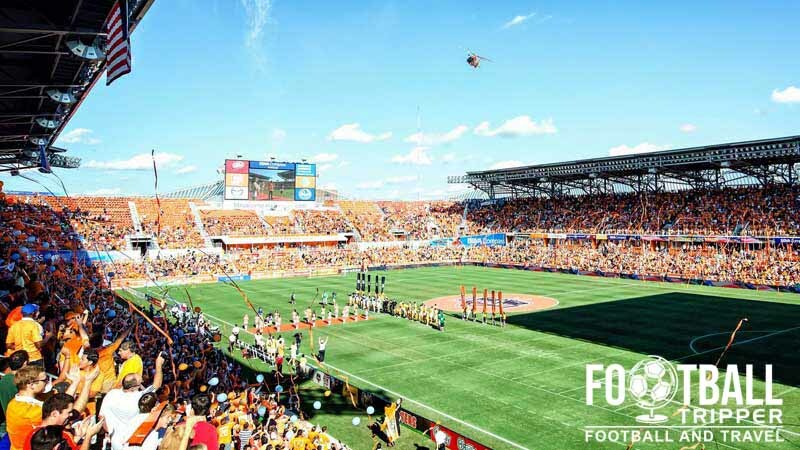 Houston Dynamo operate tours of BBVA Compass Stadium for a minimum of 10 people between Monday to Friday, with no tours available at the weekends or on the day of matches. A sneak peak inside Houston Dynamo’s locker room, you will see plenty more on the tour including the tunnel and pitchside. 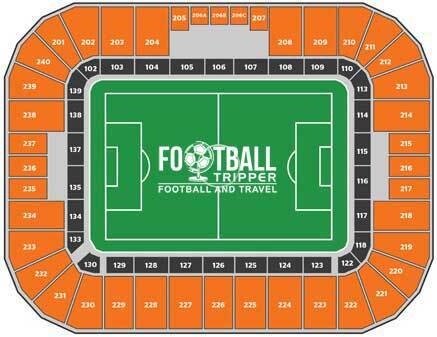 Tickets are uniformly priced regardless of age, and are instead mostly categorised depending on where you are sat and whether you are in the lower or upper section of the stadium. Please note that all tickets are subject to a service charge and tax. Some seats are available under General Admission $24.00 and Standing Room Only $22.00, however you cannot choose your location and it is allocated to you upon arrival. BBVA Compass stadium is located on a piece of land in East Downtown Houston which borders nearby the nearby city of Texas. An outside look at the vivid exterior of BBVA Compass Stadium which is a brilliant blend of orange and steel. At the stadium there are two official car parks known as Lot B and Lot C. They usually open for up to three hours before kick-off and require you to purchase and display a hang tag before entering. Dynamo parking passes are often pre-sold to members on an annual basis but there is also a reasonable amount of cash parking on game days. From Spring 2015 onwards a new Metro station is scheduled to open which will connect BBVA Compass to the heart of Houston. Known as the End End Line, the metro stop will simply be known as EADP/Stadium Station and will allow fans to park further out of town. For up to date timetables and to check the line is running visit Ride Metro.org. which is run by the Metropolitan Transit Authority of Harris County, Houston , Texas. Currently there are buses in place of the Metro. You can check out the Bus schedule here. Fans proudly welcoming their team onto the pitch during their inaugural MLS season. To encourage a smaller carbon footprint on matchdays there are numerous bicycle racks dotted around the stadium’s entrances, with fans able to take helmet into the ground provided they can be stored under the seat during the game. The city of Houston is served by the George H.W. Bush Intercontinental Airport (IAH) which is the largest flight-hub for United airlines, and William P. Hobby Airport (HOU) which is used by budget-airlines such as Southwest and Jet Blue. Situated in East Downtown there around 10 or so hotels within the immediate vicinity of the stadium. The four closest are the big name chains: Westin, Hilton Americas, Embassy and Four Seasons.